Short, middle-aged, frighteningly average. 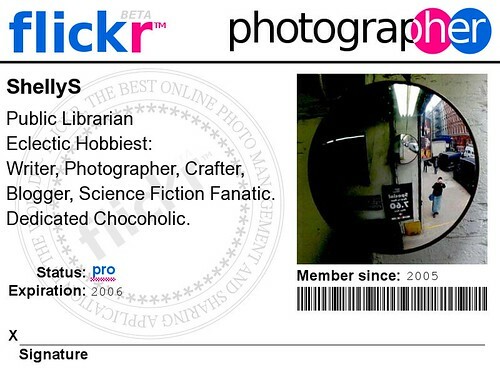 Lover of reading, writing, photography, science fiction, comic books, dolls and dollhouses, toys, and chocolate. Ever since I got my first camera, a Brownie Starmite, in 1962, photography has been one of my many hobbies. My photoblog is Creative Endeavors. I've added many of my older photos to my flickr account. They were taken with my Brownie Starmite, a Kodak Instamatic, a Minolta Maxxum, and a Pentax film camera. If I don't join a group I'm invited to join, it's simply because I don't think I'll be able to come up with appropriate photos or because there are too many rules to keep track of. I do appreciate the offers, though. I really don't like the animated graphics in comments and will delete them. Thanks for understanding. I also won't add invited photos to groups that don't have public pools. If a group goes private after I join, so be it, but I can't join every group and I don't think it's fair that neither I nor others not in a group can see my photos posted in non-public pools. "I just know that if a thumbnail makes me smile then it's going to come from this fantastically creative stream!